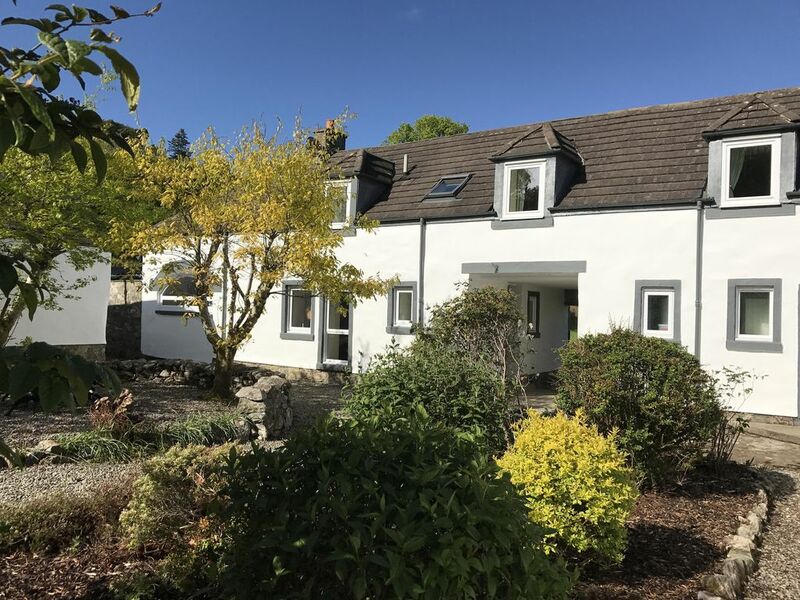 Fraser Cottage is one of the Dunmore Cottages on 120 acres of peace and tranquillity on the shores of West Loch Tarbert in South Knapdale, just seven miles from the fishing village of Tarbert on Loch Fyne. The good news is that they have already commenced the renovation of the cottages and the renovation of Fraser Cottage was completed in December 2018. Fraser Cottage is a luxury traditional 2 storey stone cottage. The Cottage comprises two ensuite bedrooms on the 1st floor with showers and underfloor warming in the en-suites. The master bedroom has a king size bed and the other bedroom two single beds. Downstairs the kitchen and dining area are fully equipped to the highest standard including dishwasher and Nespresso coffee machine. The living room has a wood burning stove to provide a lovely cosy feel and a 4k curved screen TV. Patio doors lead out into the garden where you can catch the morning sun and watch, through the trees, the ferry sail by to the island of Islay several times a day. Dogs are welcome in Fraser Cottage. Ross Cottage is dog free. Please note in Fraser we will accept a maximum of one large/medium dog or two small dogs. Both ensuites have walk-in showers with Mira Power showers, vanity units, electric towel rails and underfloor heating. There is good parking on site. The Cottage has a wood burning stove. Logs are supplied. Fully fitted kitchen with electric cooker, microwave, fridge, washing machine and tumble drier. There is a patio area accessible through the living room door which overlooks the large lawn area. More than four guests? Then why not rent our 4 Star Ross Cottage, a luxury two bedroom en-suite Cottage a stone's throw away. We would please ask you to leave Fraser Cottage as you find it. Thank you. Always a worry when selecting a property but on arrival any worry was quickly dismissed. The location is simply wonderful and absolutely perfect for a quiet break. The countryside is amazing with outstanding views and perfect for anyone looking for a country style holiday, walks, cycling or simply peace and quiet. The village of Tarbert is 6 miles away but with few shops but there is the Coop, which is well stocked. The cottage is indeed luxury. It's spacious with two fabulous bedrooms both with quality and modern (brand new) en-suite facilities right down to the under floor heating. The beds, linen, towels etc are worthy of any 5 star property and the owners have gone above and beyond with what is supplied e.g. toiletries etc. Kitchen is again brand new with lovely stylish units and despite trying our best we could not think of anything that was not supplied in terms of the quality crockery, utensils etc. Quality white goods with Neff oven, Bosch washing machine, dishwasher etc. Quite simply the kitchen is fabulous. The owners even provided napkins, cook books, oils & vinegar, loads of cookware (again high quality). The lounge is large with a wood burning stove, logs were provided and there is a log store right outside when we ran out. Free View TV with a curved screen, which is rather more than ever could be expected. Lovely sofa and chairs with coffee and side tables and with stylish ornaments to make the place homely, and it most certainly was. Thanks to the owners for the bottle of bubbly and shortbread, which sums the owners up i.e. brilliant to deal with, highly professional and take time to make sure you are well looked after. I can't praise the location, the cottage and the service highly enough. You will not be disappointed if you book, as we will do so again for sure. First of all the booking process and dealing with the owner was first class. We were kept informed and any questions we had were always answered quickly with full details given. Any worries we had about booking a property from a website were quickly dismissed. The drive to the location was amazing with gorgeous countryside and very quiet roads. On arrival it's almost unbelievable, the property is simply stunning as is the surrounding area and views over the fields. A short walk to the loch through the trees was amazing helped of course by the wonderful crisp weather we had. The property itself has been recently renovation. Everything can only be described as modern, high quality, workmanship top quality and stylsh. The owners can only be proud of how they have presented the property. Kitchen with everything you could possibly need and more. We tried hard to find something that was missing but that turned out to be impossible, right down to a garlic crusher, various cook books, dishwasher tablets, just everything was there. High quality Neff and Bosch appliances, top quality cookery ware, utensils and crockery. Worthy of 5 star for the kitchen alone. Bedrooms had very comfy beds, high quality bed linen and towels. Unexpectedly we were provided with top quality toiletries. Shower rooms were modern with no expense spared in the quality of the showers etc. Lounge was tasteful, again quality furnishings, smart curved TV etc. A real home from home and with a lovely log fire. The owners kindly left a bottle of fiz, biscuits and even some treats for our dogs. Loads of logs for the fire right down to a box of matches. We can't recommend the location highly enough. If you want peace and quiet in a fabulous property you don;t want to leace then this is it. A magical weekend thanks to the owners. Comfortable and spacious cottage situated in beautiful countryside with lots of fantastic walking opportunities.The bedrooms have recently been renovated to a very high standard. Would readily recommend the cottage. We plan to visit again! Thank you for taking the time to provide a review of Fraser Cottage. We look forward to welcoming you back to Dunmore. Relaxing holiday in Dunmore cottages! My wife and I stayed in Fraser cottage for 4 nights and it was superb. The cottage has 2 spacious brand new bedrooms and the downstairs has a nice living room with wood burning stove. The surrounding area is stunning to explore and Tarbert has a good selection restaurants, particularly Starfish. The ferry terminal to Islay is about a 20 min drive from the cottage and is an excellent day trip. Same with Arran ferry, about 30 mins away. Kilberry Inn (10 min drive from the cottage) is a must for a special meal! It is very peaceful at Dunmore and is perfect for a relaxing holiday or break. We will be back in the future for sure! Thank you for taking the time to provide a review of Fraser Cottage and Dunmore and some of the highlights of the surrounding area. We will look forward to welcoming you back. The property was much roomier and more comfortable than it appears on the website..
We enjoyed the location and peaceful surroundings very much indeed. The planned new kitchen and hopefully WiFi will create 5 star accommodation. Local maps and books of walks would have been appreciated but otherwise everything was great. Thank you for taking the time to provide us with feedback on your stay at Fraser Cottage. We are pleased to hear you enjoyed the location and surroundings and we are looking forward to completing the last part of the upgrade of the cottage later this year. We will also look to add maps and information on local walks in the area. Dunmore Cottages are situated along the B8024, eight miles from the fishing village of Tarbert, Loch Fyne. Head South out of Tarbert on the A83 for one mile then take the right turn, sign posted Kilberry B8024, at the golf course turn left, signed Kilberry B8024 and continue along this road, past Torinturk, after approx. 2 miles you will come around a sharp bend to the right and you will see a sign Dunmore Cottages on the right, please turn in here. After the grey gate you will see Campbell Cottage on your right then an alley way, if you walk down here Fraser Cottage is under the archway on the left. Lettings in April, May, June, July & August are usually from Saturday to Saturday, however please inquire if you would like a shorter or longer stay. Our three night breaks are usually available during the months of November, December (excluding Christmas & New Year) January, February and March.